Housing Europe is celebrating its 30th Anniversary in Tallin with their annual conference and assembly. Wednesday 6 June: Ad-Hoc Working Group in support to countries with housing systems in Transition – 10.30 to 13.30 at the Maarjamäe Palace halls. After lunch there will be two study visits which will draw inspiration from two innovative projects that have been developed in Tallinn. The visits will conclude with a brief seminar around the two topics of focus in the respective projects. On the same day, Co-operative Housing International (CHI) will be holding its annual meeting at the same venue. In the evening, the Tallinn City Government will organize a welcome and networking reception with drinks and snacks for all participants of a truly global housing meetup in the Tallinn Town Hall. Thursday 7 June: annual international conference of Housing Europe. Speakers to include Adam Greenfield, world-renowned American Writer and Urbanist. 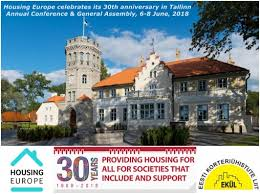 Friday 8 June: annual General Assembly of Housing Europe, 9:45-12:45 in the Hotel Park Inn by Radisson Meriton Conference & Spa Hotel Tallinn.